Compressor currently used mechanical refrigeration cycle is one of the most important mechanical main components of air conditioning. Air conditioning can be considered as the heart of the cooling system.Compressors formation of mechanically moving parts working alongside the most in terms of internal structure it makes malfunction causes. Cooling the refrigerant in the low pressure and high pressure loop absorbs the mechanical structure of the refrigerator main element that compresses printing task. In today’s structure of household air conditioners usually have three different compressors are used. Of course, the refrigeration cycle is the same as in the logic of what they are doing. These mechanical structure is used for separating the suction and compression work from each other. Already they have called considering the mechanical structure used in compressors. For example, piston compressors in the compressor’s internal structure so we call for the intake and compression pistons are mechanical parts, such as cylinder and crank. General structure of most types of compressors used in household air conditioners can be classified as shown in the following Figure 2.1.
compressors used in air conditioning systems are sought following features. But there is no compressor, having all of these characteristics may be called. compressor can provide most of the above characteristics according to the conditions in practice, the choice is preferred. House type air conditioner that we use in the system if we briefly examine the mechanical structure of the compressor. 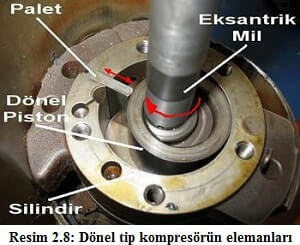 Welded hermetic reciprocating compressors, the body was placed in a sealed engine (piston compressors), a structure that can not be found in the services such as maintenance and repair.This makes the movement of a piston linearly reciprocating in the cylinder in the housing of the mechanical system is shown in Fig 2.2. This circular motion to obtain the linear movement benefited from a crankshaft and connecting rods that converts linear motion (see. Figure 2.3) this type of compressor 1/2 hp up to single-piston produced hermetic compressors , two or more pistons are manufactured for larger forces. conditions for applying reciprocating compressor, the refrigerant cooling unit that corresponds to the volume of the cylinder capacity and the need for less but suction / discharge pressure difference is reduced much more than Refrigerant suitable for those. 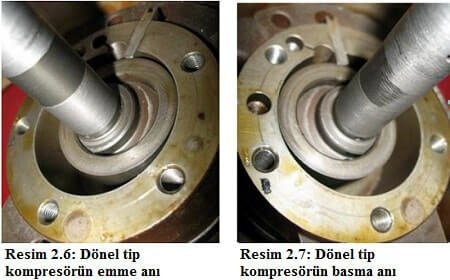 linear movement of the piston inside the cylinder during the intake and discharge valves has entered into operation. Taking the same name because of the location they are working, these valves are referred to as suction valve and discharge valve. Image 2.4 and Image 2.5, press and shown on the intake valves valve plate. Reciprocating compressors we are talking about mechanics as working parts also raises the possibility of malfunction to be more. Full closed hermetic motors with horizontal axis and vertical axis of the crankshaft in the cylinder reciprocating compressor arrangement is applied too often. Due to the nature of full-hermetic reciprocating compressor suction vapor passes through the motor windings prior to the cylinder or cylinders. This means that the withdrawal of a portion of the heat in both the motor windings, but also helps to evaporate any liquid refrigerant that may have entered the compressor. Crawler compressors, use the rotary motion when the compression process instead of reciprocating piston compressor. The structure of this type of compressor the piston compressors than simpler and usually consists of fewer parts. Rotating the suction side by rotating the cylinder or from a pallet disposed around the rotary piston in the cylinder piston on the other hand makes the compaction process (Figure 2.6 and 2.7). Vane compressors, mobile pallet types and varieties, including two types of fixed palette. Today, home air-conditioner fixed crawler-type compressors are used frequently. It is fitted to the pallet rollers in fixed tracked rotary compressors are rotary joining movement (Figure 2.8). The most important considerations in moving rotary compressor; contact each other by the working space between the surface irregularities is less moving parts as possible (to reduce leakage) and friction / wear to a minimum to ensure retention is made good lubrication. Also, manufacturing techniques with a good sound and vibration levels may be at a much lower level compared to reciprocating compressors. – Cylinders: internal surface in contact with the moving camshaft and two opposite side surfaces are treated with very narrow tolerances, ground and honed. Sealed design method usually applied to vertical engine / compressor axis is a form of arrangement. – Camshaft: The drive shaft eccentrically in the inner surface of the outer casing when the rotary motion of the rotor moves scraping to detect. The rotor is made from special steel grinding in tight tolerances and polished. – Palette: compressor efficiency is greatly needed is connected to the sealing level of the pallet processing and shaping them with very fine tolerances. kind of material they are made, skilled gray cast iron, steel, aluminum and can be considered as carbon. Pallet thickness is selected such that the maximum deflected under load. 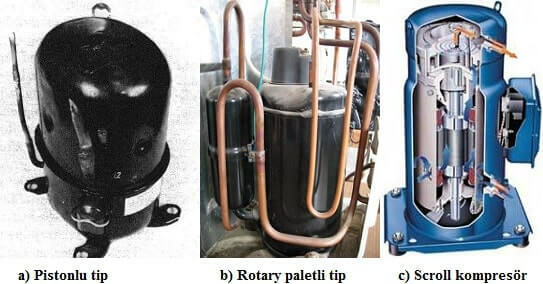 The compression spring force pressing against the pallet rotor, according to the condenser and the condensing pressure is determined Refrigerant increased by 25%. – Valve: There is no need for a continuous flow of the intake valve is the rotary compressor. Push side, made of high quality steel, leaf type is usually a valve (valve) is placed. 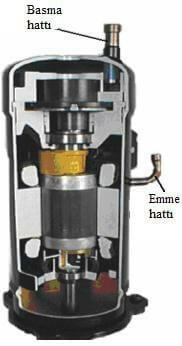 Valve thickness, depending on the compressor size ranges from 0.1 to 0.3 mm (for 5 HP small compressors). It is smooth and smooth the edges of the leaves are very important in terms of the valve seal.Crawler type in the high pressure in the compressor discharge valve refrigerant opens directly into the compressor housing. Press the system from the discharge pipe into contact with the electric motor windings. So there it enters directly into the suction chamber from the refrigerant fluid intake.In this case, both the compressor to operate at high temperatures and increases the likelihood of exposure to refrigerant fluid strokes. This is why the compressor that can withstand the heat of all mechanical and electrical parts of the motor windings are specially manufactured way. To prevent return of fluid pulses are produced in a way that may come from batteries mounted on the side. These types of compressors for household air conditioning systems are used very rarely. No one inside the structure of this compressor is formed in the fixed and mobile two snail spiral appearance. Moving snail which rotates at high speed in the opposite direction at 180 ° fixed snail. Precision machined and high-speed rotating between the cooling fluid slugs along with the absorbed oil seal is provided. Snail (spiral) structure caused by the rotation direction of each other in sweat, gas is sucked into the gaps between spirals snails. 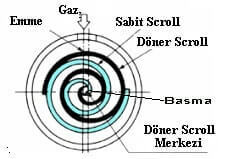 Absorbed into smaller volumes of gas transported consecutive spiral mobile compression process continues to increase until the central parts of the snail (Figure 2.2). System capacity and volume of rotor speed scroll function enters a structure must change as positive because the compressor class. each one is bedded from both ends of the fixed and movable scroll compressor running snail (spiral) are precision machined to seal the pieces ar. the scroll compressor has no suction and discharge valves. Picture 2.14 we will examine it carefully, it is in contact with the electric motor windings are opened to direct our body from absorbing fluid cooler.Printing output is given out from the discharge pipe immediately fill out the top portion of the housing.I.e., contact with the hot gas in the discharge electric motor windings is not an issue. In this embodiment the scroll compressor of the high temperature and will prevent a bit to be exposed to refrigerant fluid impact.